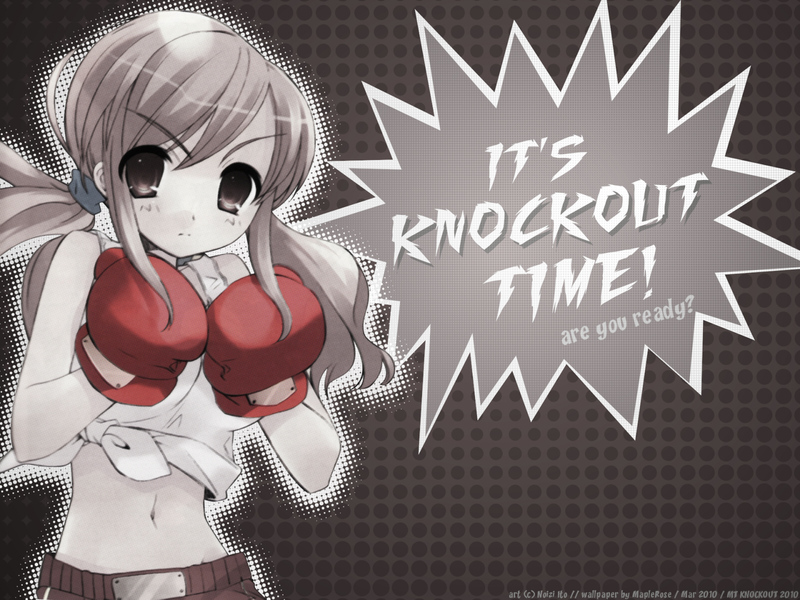 The Melancholy of Suzumiya Haruhi Wallpaper: It's KNOCKOUT time! Minitokyo »	The Melancholy of Suzumiya Haruhi Wallpapers » The Melancholy of Suzumiya Haruhi Wallpaper: It's KNOCKOUT time! The font is from dafont.com, called "Fighting spirit"
Haha, nice promotional wallpaper! I like your use of halftones and the placement of things 8) I just think that Mikuru needs to be sharper to match the crispness of the explosion bubble thingy, hehe. But it's also interesting how she's a bit blurry as if she's moving, lol. Oh, maybe having the background dots zoom out of the explosion might add more to the wallpaper? i never thought she can do that !